Your EC accommodation allows you to more fully integrate into the EC community so that you get the most out of your experience. Your EC homeis your place to relax and recharge, so it is important that you feel comfortable. That is why we have accommodation options to suit your tastes and needs. Our private acommodation provides a higher level of comfort and amenities. With improved design, this accommodation is reccomended for 30+ students and for those who want to have an exclusive use of the appartment. All the apartments are located up to 25 minutes walking distance from school. The apartments are decorated in a modern style, offering a fully equipped kitchen including oven, hob, microwave, fridge/freezer, toaster and kettle, with a kitchen, living and dining area. 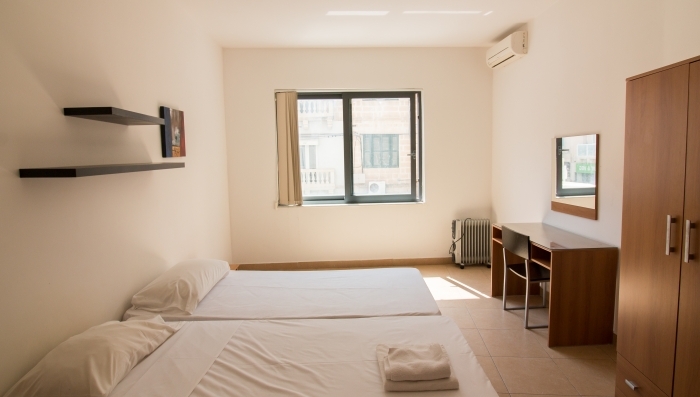 Air-conditioning available in all bedrooms.The maximum capacity of our apartments is two (2) students per apartment. One of the residents must attend an English course at EC Malta. Students cancelling or postponing fewer than 14 days before arrival will be charged a one-week accommodation fee at the standard accommodation rate and the accommodation placement fee. Students leaving their accommodation must give notice in writing four (4) weeks prior to termination. After deducting the price of accommodation used, including the required notice period charged at standard accommodation rates, students will be refunded the remaining accommodation costs. If the four- week notice period is not provided, a cancellation fee equal to four (4) weeks of the accommodation cost will apply. Arrival and Departure transfers are included free of charge when booking course and accommodation with EC. Students staying in EC residences whose flights arrive Saturday and Sunday between the hours of 9:00 a.m. - 9:00 p.m. will be taken to EC Malta for a short introduction to the school. Important first day information and access to apartments will be given. A driver will take the student to the apartment with a member of staff who will show the student the apartment and complete a checklist. Students whose flights arrive outside of these times will be greeted at the airport by an EC member of staff. A driver will then take the student directly to the residence. Heating in winter from 15 December to 15 March in bedroom and living area can be used free of charge; however, heating must be switched off if no one is in the room (fair use policy). During summer, a fan is provided in every bedroom. A/C cooling or heating outside the above dates and bedrooms may cost on average €5 - 10 per day and can be paid for a meter. AC electricity consumption depends heavily on usage and the cost may therefore be above the aforementioned amount. A €20 refundable deposit will be collected for the remote control.